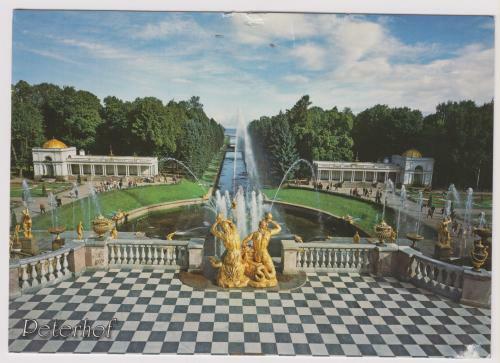 I received Postcard RU-1237795 last year on October 11, 2012, showing the Grand Cascade in front of the Grand Peterhof Palace near Saint Petersburg, Russia. This imperial summer residence in Peterhof is also known as Russian Versailles, which is part of the Historic Center of Saint Petersburg and Related Groups of Monuments that was recognized as a UNESCO World Heritage Site in 1990. Peterhof is perhaps most famous for its remarkable array of decorative fountains -- 173 fountains, 4 cascades, numerous sculptures and charming pavilions -- including the unmistakable and incredibly impressive ensemble of the Grand Cascade. The Grand Cascade runs from the northern facade of the Grand Palace to the Marine Canal, comprising 64 different fountains, and over 200 bronze statues, bas-reliefs, and other decorations. The first sight for visitors arriving in Peterhof by sea will be the vista of the Grand Cascade with the Grand Palace behind it, which is truly breathtaking.